You want to build an email list. But, that’s not the only thing. You want to build an email list fast. 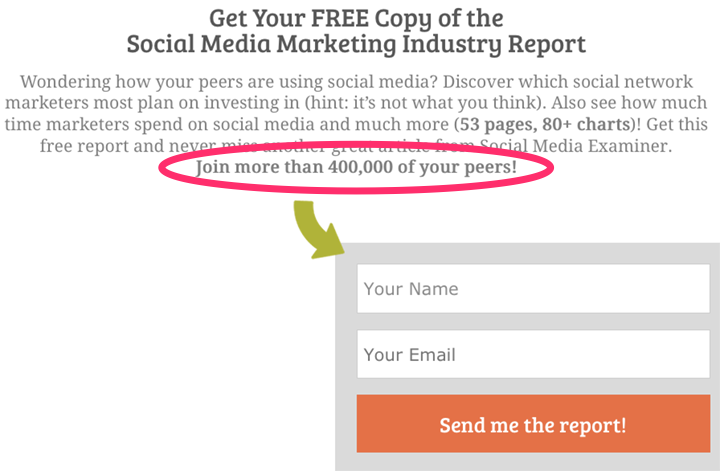 Sure, you can create a free report and throw an opt-in box on your page. But, that’s not going to get you there quickly enough. If you have a product in the works, here are 21 ideas that will help you create the perfect freebie, market your opt-in and build your email list at lightning speed. No matter your chosen tactic, it pays to know who you are targeting. Before moving forward with anything, think about the who, where and why regarding your opt-in offer and marketing strategy for it. A good way to start is to think of a buyer persona. This is a fictional person who is your ideal customer. After figuring out your buyer persona, you want to start tailoring your content to those people. Maybe you found out that your target market consists of work at home moms that are looking to freelance. From here, you can start planning out a content schedule with niche-related topics, and a lead magnet suitable for this audience. Consider the course you plan to sell, or your main product, and create an amazing offer that relates to it. If your audience isn’t interested in your freebie offer, chances are they won’t be interested in what you have to sell. Access to a private community – Mary Fernandez offers access to her private Facebook community after you download her Guest Blogging Index. 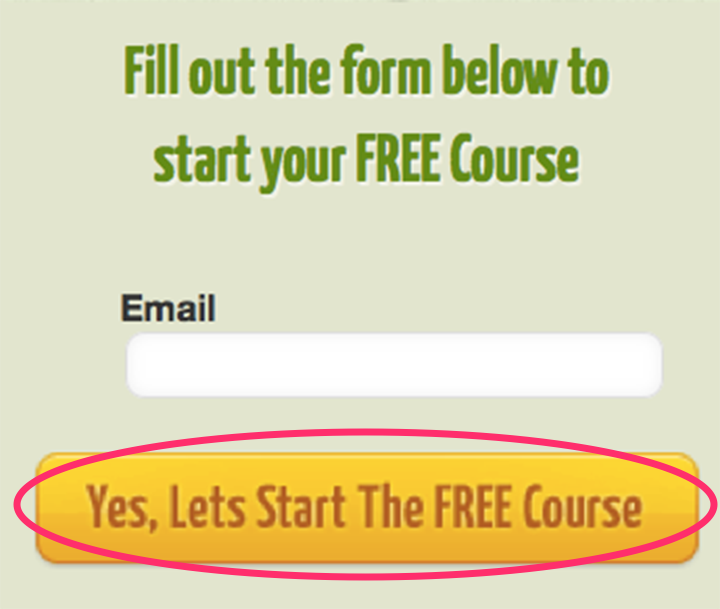 Email course – Free courses are popular and many solopreneurs are creating them. What’s great about doing an automation sequence is the fact that you will appear in your subscribers’ inbox daily. Imagine having a 10-day email course, plus welcome email and follow-up email? That’s a quick way for people to get “hooked” on your brand and content. As an example, Mariah Coz has a 10-day free course on Building Your Profitable Blog. Not everyone’s audience likes to read long pieces of content. To really sell your freebie to your audience, think about how they like to consume their content. If your ideal customers are readers, go ahead and stick with a free report or eBook. If you think an email course, video series or webinar would attract your target audience, test it out and see. This all goes back to knowing your readers. If you are still unsure about what type of lead magnet they would like, then ask them. Give them a choice of three types of lead magnets to see which one is the most popular. You can also hit up Facebook groups too! Have you ever tried to sign up to an email list and ended up getting frustrated because you had to fill out so many boxes and jump through so many hoops just to sign up? Don’t put your audience through that. Ask for just a name and email address. You can simplify it even more and ask just for an email address. The least amount of information your readers have to divulge, the more apt they are to give it up and the more conversions you’ll see. Another way to make it easy for your visitors is to make sure your copy is explicit. Do they know exactly what they are signing up for? Make it clear in your copy who this is for and what they will be getting once they sign up to your list. An opt-in box in your sidebar isn’t enough. Create a stand-alone squeeze page for your free offer. Take a look at Copyblogger’s squeeze page for their products. 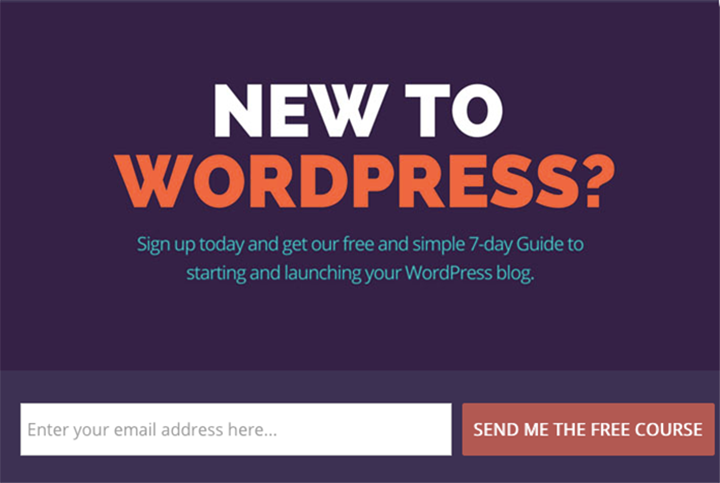 Use this space to entice your readers and explain the benefits of signing up for your list. Talk about the highlights of your offer and make sure to add a call-to-action and signup box. What’s the added benefit of using a squeeze page? People much prefer them over popups. This is your chance to really sell your reader so use bullet lists, testimonials and social proof. Make the page useful and tailored specifically for them. There are several tools you can use to create your squeeze page, but LeadPages, Pagewiz or Thrive Leads are popular choices and can get the job done in a cinch. Your squeeze page is another page that you can optimize to attract organic traffic. Of course, I’m not saying to over-stuff your post with keywords. But, you should place your main keywords on your page and create a proper SEO title and meta description. And remember to get some quality backlinks to your squeeze page as well. An easy way is by including it in your author bio when guest posting on industry related, high-authority websites. Now that you have a separate squeeze page for your opt-in offer, share it whereever possible. Share a link on Facebook, tweet about it on Twitter and pin it to a group board on Pinterest. Promote it on all your social media networks. And like I briefly mentioned in the previous point, guest posting is a popular and effective way to generate traffic back to your squeeze page. If you know of any sites related to your niche, find out if they accept guest posts, or you can quickly do a Google search using the keywords, “write for us” or “guest post” plus the blog name in question. Squeeze pages are for sharing and attracting readers, splash pages are for those readers who have already found your site. 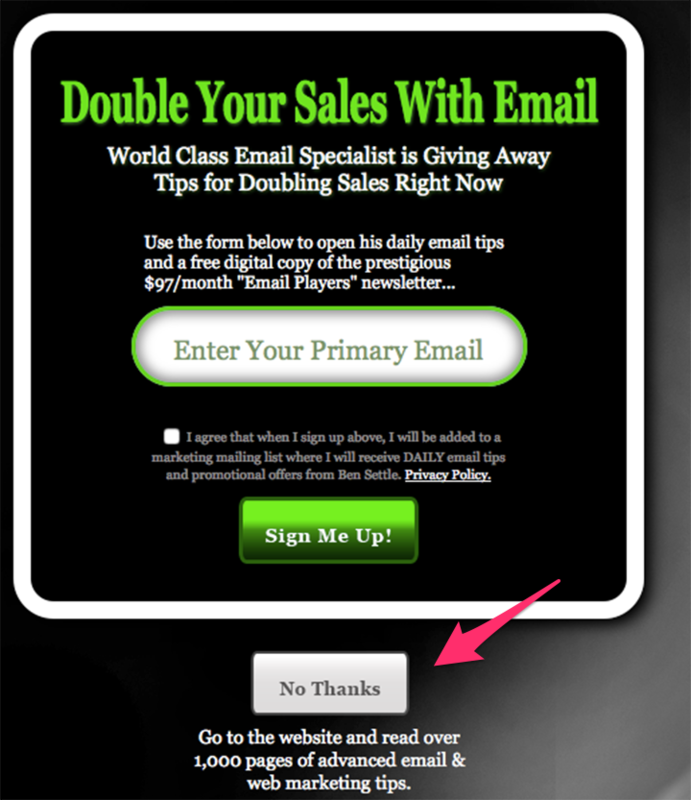 This is a great tactic since you already know that the person looking at your splash page is interested. They came to your site to view your content, which means they are more likely to take up the offer on your promotional page. Another way to use social proof to your advantage is to have testimonials on your landing page or lead magnet. What if no one has used your guide or product? Enlist a blogger friend or pool a sample from your list to try it out. Then ask them for a testimonial. Chances are your call-to-action (CTA) button says something like sign up, submit or subscribe now. These are great, but they don’t quite convey what’s in it for your readers. If you don’t already have one, start a blog. You don’t have to post daily, or even strive to become a pro blogger. Blogging just once a week will give you more opportunities to optimize your site and share content on social media. Blogging is also a way to share useful information with your audience, showing them that you really know your stuff. The more your audience sees you as an authority, the more likely they are to sign up to your email list to learn more from you. When setting up your blog, make sure to also set up a content schedule so that you never have to run into writer’s block. Include topics or headlines and suggested publication dates on your schedule. Content upgrades are really effective. Since you are going to be blogging, consider creating a separate offer – a content upgrade – for each blog post. I know it’s not an easy task, but if you create a specific freebie that relates to each blog post, you can skyrocket your conversion rate. Your free offers don’t have to be complicated. You could easily create a one-page checklist, resource list or cheat sheet that relates to the blog post. 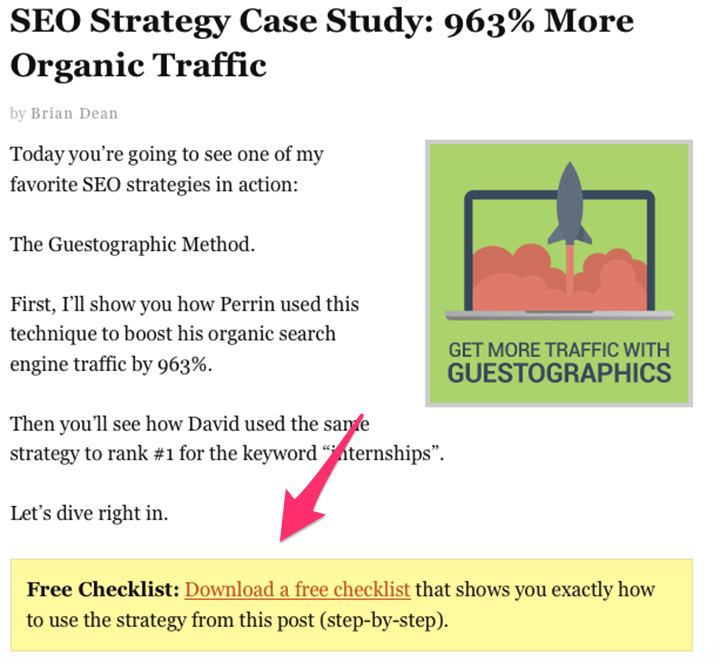 Brian Dean of Backlinko does a fantastic job of enticing his visitors to sign up to his freebie by giving his readers full access to his strategies. A simple way to create a content upgrade is to create a list post and only offer half of your list, and then lock the other half in a content upgrade. Since people are reading your post to learn about your list of tips, they will be more likely to grab your upgrade so they can finish reading the list of tips you offer. This one should be obvious, but it’s worth mentioning. Sharing your blog posts isn’t just great for generating website traffic, but it’s also great for bringing attention to your blog posts … and their related opt-in offers. 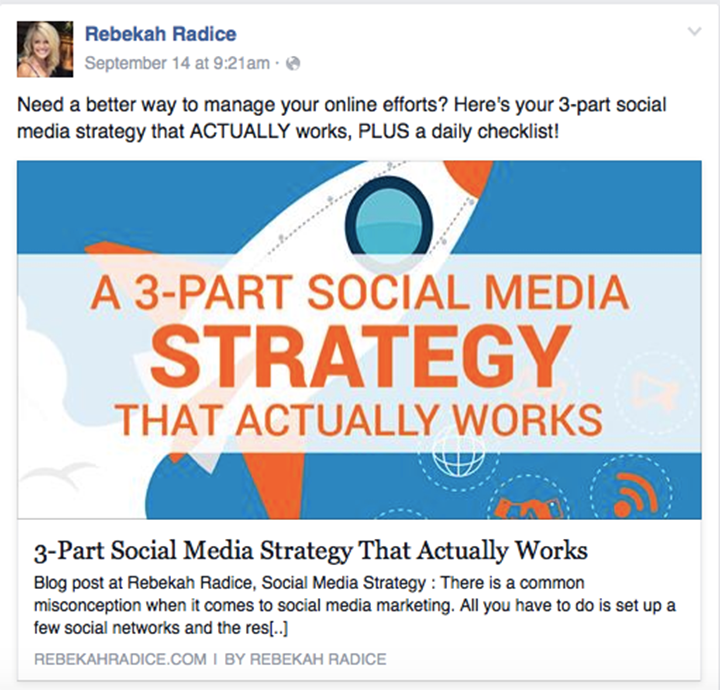 Master two or three social media platforms instead of trying to tackle them all. Start with the platforms your main audience spends the most time on. This will probably be Twitter and Facebook or Pinterest. If you find that doing this takes up too much time, consider using an automation tool like Hootsuite, Buffer or Tailwind. Don’t be afraid to capitalize important words, use exclamation points and be conversational in your status updates. Typically those types of posts have high engagement since they are relatable. There’s no shame in asking your followers to share your blog posts. Encourage your followers to like, share and tweet your updates to help spread the word. Use your social media following to your advantage. An easy way to do this is to email them. Let them know you have a post out and ask them if they’d like to share it. Also mention that it’s no big deal if they don’t as you don’t want them to feel obligated that they have to share your post. Once your email list starts getting some traction, send out a newsletter. You don’t have to come up with something epic; a short intro and a link to your latest blog posts is fine. But make sure you are personable. Simply blasting your list with a blog post will surely result in some unsubscribes. To avoid this, tell a story, open up and relate that to a blog post you are promoting. The point is to send these on a regular basis, send something useful, and ask your subscribers to share your newsletter with people they know. 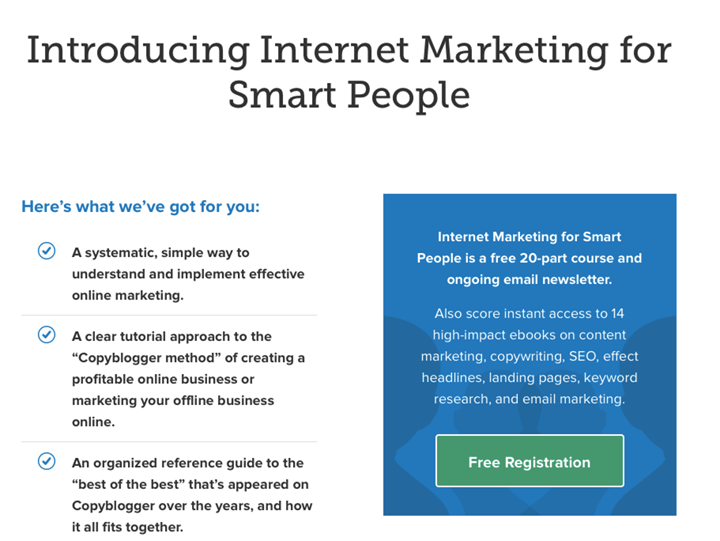 Webinars, especially free webinars, are an excellent way to build your email list. Create a webinar on a topic your audience is truly interested in. It doesn’t have to be a long webinar, half an hour or so is perfect. Promote your webinar on social media and tell your followers the value in signing up. 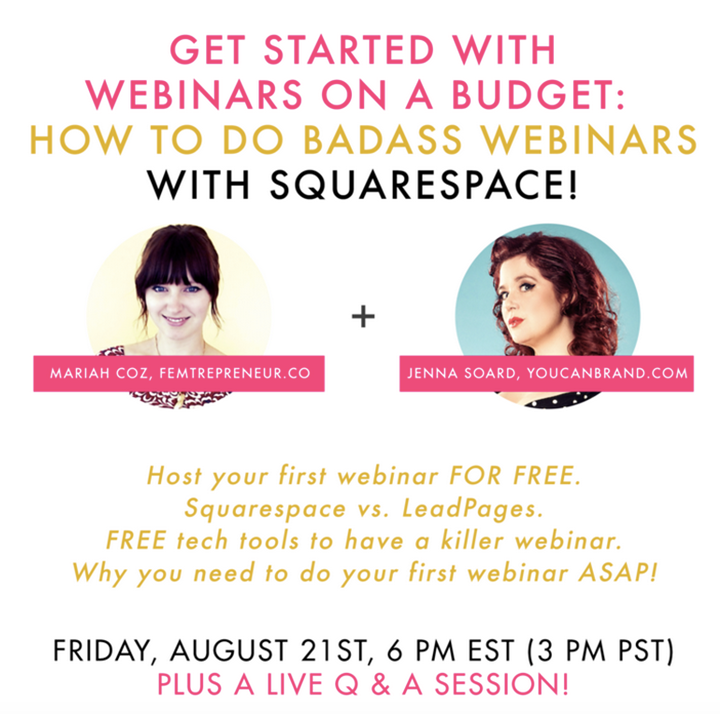 Mariah Coz of Femtrepreneur is killing it with her webinars. She’s even doing webinars about webinars! A great traffic and email subscriber generator is to co-host your webinar with someone more popular than you. You’ll have a new audience to promote your products and services to, which will help you grow your email list. Bonus for creating a webinar: Webinars can lead into a product or service you have for sale. Make sure your webinar relates to whatever you’re selling and intrigue audiences by giving them some information but leave them wanting more. Do this and they will want to buy your product or service! Ask your current subscribers to invite their friends to join your list, and make it worth their time. Offer something you know your subscribers would like, such as free samples or discounts, and name-drop them on social media – whatever fits your audience. Don’t feel shy about asking people in your Facebook groups for referrals either. Most people will jump on this opportunity since it’s a way to do the whole, I’ll scratch your back if you scratch my back thing. Guest blogging on popular sites gets your name and website out there. Especially if you end up guest posting on popular sites like Kissmetrics, Huffington Post, Scary Mommy or Smart Blogger. It’s perfect for building traffic to your site and it’s also a great way to build your list. Pick blogs whose audience is closest to your own and write epic guest posts. Make sure to include a link to your squeeze page or home page (as long as you have a splash page set up) in your author bio. Most commenting systems allow you to link to your latest blog post or your website. So, when you leave a comment, you can link back to your landing page or blog. You don’t have to target the largest blogs out there to comment on, but you do have to find the ones with readers closest to your own. Also, you can’t leave simple, one-sentence comments. That’s not going to help bring you subscribers. Leave longer comments, ones that add value to the blog post. The more value you provide, the higher the chances are that comment readers will follow your link back to your own site. Also consider commenting on posts that have CommentLuv enabled. This lets you link to a blog post of yours and can encourage others to click on it – if your headline is enticing. This is a great way to grow your email list, your blog traffic, and your authority. Connect with bloggers – called blogger outreach – on social media, comment on their blog posts, sign up for their email lists and participate in their discussions online. Once these bloggers see you as someone who supports them, they will start supporting you and sharing your blog posts with their own audience. But don’t think this can happen overnight; blogger outreach is a process and it takes time to cultivate a relationship with bloggers big and small. There you have it! 21 proven ways to grow your email list in record time. Key takeaways: have the right offer and promote it well. When you have the ultimate opt-in for your target audience and you have a solid marketing campaign to promote it, you’ll notice a difference in your subscriber rate. So, give these ideas a try and watch your email subscriber rates skyrocket. Let us know in the comments what you’ve done to grow your email list. Great piece Elna. Thanks for all these tips. I think newsletters are also a great way to share and update everyone in the mailing list. But I often notice, most newsletters end up in the spam box. How can we avoid that?